4.1. Each year the treasurer shall collect from each seminarian in residence a student activity fee of $35, to be deposited in the Student Senate accounts for disbursement by the Student Senate in its discretion acting by resolution. 4.2. The student activity fee for new seminarians in residence will be collected during orientation week by the orientation week staff, separately from all other fees charged to new seminarians, and transferred by October 1 to the Student Senate accounts. 4.3.1. The treasurer shall provide individual written notice to each returning seminarian in residence by November 1 of each year that the student activity fee is due and payable within 30 days. 4.3.2. If a returning seminarian in residence fails to pay the student activity fee within the 30-day period, the treasurer shall provide to him one additional individual written notice that payment is overdue and must be paid within 15 days. 4.4. 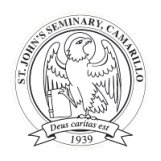 Each seminarian in residence is responsible for providing for the prompt payment of his own student activity fee, including obtaining any necessary financial aid to pay such fee. The treasurer shall be reasonably flexible in allowing a seminarian time to obtain funds to pay the student activity fee, but abuses of such flexibility should be reported to the Dean of Students for appropriate disciplinary action.